Abstract: Perioperative ischemia is an area of ongoing concern for anesthesia providers. The issue is multifactorial and individual patient risk factors influence both outcomes and approach to care. Intraoperative hypotension is an independent risk factor for ischemic stroke. Response to adrenergic stimulation of the cerebral vasculature is not fully understood. 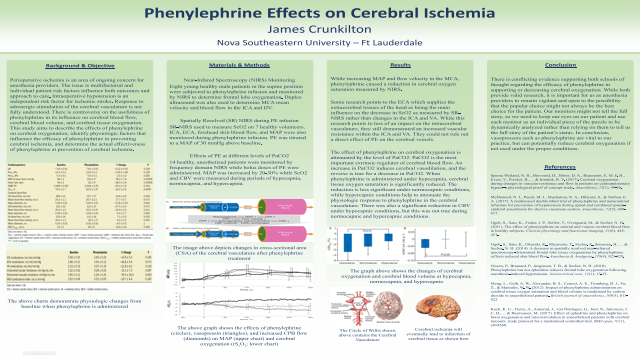 There is controversy on the usefulness of phenylephrine in its influence on cerebral blood flow, cerebral blood volume, and cerebral tissue oxygenation. This study aims to describe the effects of phenylephrine on cerebral oxygenation, identify physiologic factors that influence the efficacy of phenylephrine in preventing cerebral ischemia, and determine the actual effectiveness of phenylephrine at prevention of cerebral ischemia. Summary: There is conflicting evidence supporting both schools of thought regarding the efficacy of phenylephrine in supporting or decreasing cerebral oxygenation. It is important for us as anesthesia providers to remain vigilant and open to the possibility that the popular choice might not always be the best choice for the patient. In conclusion, vasopressors such as phenylephrine are vital to our practice, but can potentially reduce cerebral oxygenation if not used under the proper conditions. References: Sperna Weiland, N. H., Brevoord, D., Jöbsis, D. A., Beaumont, E. M. F. H., Evers, V., Preckel, B., ... & Immink, R. V. (2017). Cerebral oxygenation during changes in vascular resistance and flow in patients on cardiopulmonary bypass–a physiological proof of concept study. Anaesthesia, 72(1), 49-56. McDonnell, N. J., Paech, M. J., Muchatuta, N. A., Hillyard, S., & Nathan, E. A. (2017). A randomised double‐blind trial of phenylephrine and metaraminol infusions for prevention of hypotension during spinal and combined spinal–epidural anaesthesia for elective caesarean section. Anaesthesia, 72(5), 609-617. Ogoh, S., Sato, K., Fisher, J. P., Seifert, T., Overgaard, M., & Secher, N. H. (2011). The effect of phenylephrine on arterial and venous cerebral blood flow in healthy subjects. Clinical physiology and functional imaging, 31(6), 445-451.